Worry is one of the most common mood disorders in America. Whether you call it stress, tension, frustration, or anxiety, worry can take its toll on health and well-being. It can be caused by life changes, such as divorce or career upheaval, or it can become a debilitating chronic disorder. "The Worry Workbook" helps readers understand what causes anxiety and how they can move beyond worry into emotional freedom. Practical steps, interactive exercises, checklists, and guided questions help readers identify their fears, replace negative talk with positive action, learn to accept what is out of their control, and make life-enhancing choices." The Worry Workbook" offers insight on letting go of self-judgment, becoming real, identifying those who help and those who hinder personal growth, and overcoming insecurities -- offering those who suffer from anxiety proven ways to find relief. The Worry Workbook by Frank B. Minirth; Les Carter was published by Thomas Nelson in June 2003 and is our 37722nd best seller. 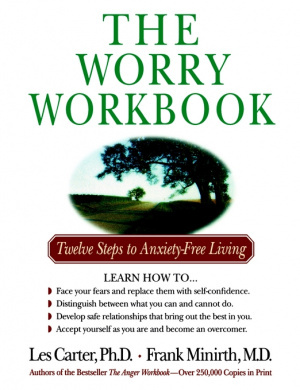 The ISBN for The Worry Workbook is 9780840777485. Be the first to review The Worry Workbook! Got a question? No problem! Just click here to ask us about The Worry Workbook.